AED.com, one of the country’s leading distributors of AEDs (Automated External Defibrillators), is promoting HeartRescue’s new online cardiac arrest simulator as an excellent tool for spreading awareness about sudden cardiac arrest in young athletes. The HeartRescue Project is dedicated to improving knowledge about SCA (sudden cardiac arrest) across the United States. The project recently partnered with Ricky Rubio, an NBA player for the Minnesota Timberwolves, to spread awareness about sudden cardiac arrest, the number one killer of young athletes. The realistic Save-A-Life simulator uses a first person view of what a sudden cardiac arrest would look like in a gym. AED.com supports their efforts in spreading awareness about this condition, and applauds them for drawing attention to the prevalence of SCA among young athletes. The HeartRescue simulator, located at http://heartrescuenow.com/, is great for spreading awareness about SCA. “HeartRescue Project's simulation of a cardiac arrest incident is helping ordinary people learn what to do if SCA ever happens to someone near them," commented Justin Darby, Marketing Director for AED.com. "This is great tool for spreading awareness, especially since they’re using a young, well-known athlete to help spread the word to a wide audience.” The general population often doesn't realize that healthy people are also susceptible to SCA. Athletes in particular are at risk because of the stress that their bodies endure during intense workouts. If a player has a heart condition, the heart can stop when put under great stress. AED.com emphasizes that, while the simulator is a great awareness tool, it is not a training video. “While the simulator shows that CPR and AED use are easy to learn, it still does not provide the hands-on training needed to assist a cardiac arrest victim.” For this reason, AED.com recommends CPR classes and AED training in order to be prepared for emergencies. 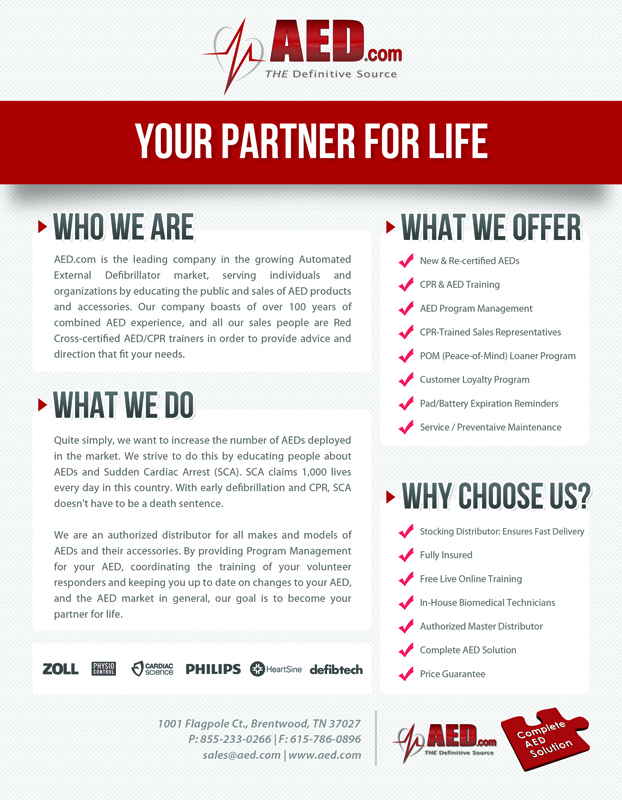 As for providing educational tools, AED.com has committed to offering live online training classes for purchasers of AEDs like the one used in the simulator. AED.com also offers links and information about American Heart Association courses for those who would like to be able to respond to situations involving SCA or others that require CPR, like the ones simulated by The HeartRescue Project. AED.com is located in Brentwood, TN and has been providing AEDs and AED education for communities and businesses since 1999. The company carries all brands of AEDs and accessories, including Physio-Control, Zoll Medical, Philips Healthcare, Cardiac Science, Heartsine and Defibtech.